As a little girl in Nigeria, Nwadiuto Amajoyi played happily with bottle caps and roly-poly bugs in the red sand of her grandmother’s garden. Even with that inventive mind, Amajoyi (College Nine ’13, psychology) couldn’t have imagined the changes coming in her life, beginning with her family’s move to Southern California when “DT” (a nickname since childhood) was just 7 years old. Twenty-six years later, she has written speeches for a senator, participated in the International Moot Court, and prepared case files for Ugandan inmates. These days she’s in London, pursuing an international law degree. Amajoyi first learned about UC Santa Cruz through filling out a UC-wide college application; a visit to the campus left her awed by its beauty. She was deeply influenced by an on-campus outreach program, Destination Higher Education, led by African American students already attending the university. Amajoyi’s extensive college involvement included serving as UC Santa Cruz student body president, Commissioner of Diversity, co-chair of the UC Student Association Council of Presidents, co-chair of the Engaging Education CARE Council, and a Destination Higher Education board member. Seeking discomfort included exploring the history of her black American and African communities, and delving deeply into issues of racism and discrimination. This, says Amajoyi, was her awakening. For instance, while struggling to attain U.S. citizenship during college—and discovering that many of her friends were undocumented—she organized a day of action supporting the ultimately successful passage of the California Dream Act. Amajoyi discovered teachers and mentors who encouraged her personal and academic growth. She found inspiration, solidarity, and support among fellow activists fighting for student rights. Amajoyi praises the value of her UC Santa Cruz degree and the leadership skills she developed during college. But she also remembers her sense of isolation and offers candid suggestions for improvements, from requiring classes in cultural competency and ethnic studies to hiring additional professors of color. 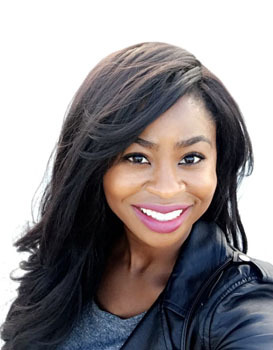 After graduating, Amajoyi acted as a California State Senate fellow before entering Pepperdine University School of Law. She also served legal internships with the Western Center on Law and Poverty, and with the Republic of Uganda’s Anti-Corruption Court. Amajoyi returns regularly to Nigeria, which she still considers home. Her dual perspective of Third and First World countries has made her more critical of Nigeria and the United States but has also, in her words, made her love both countries more fervently.